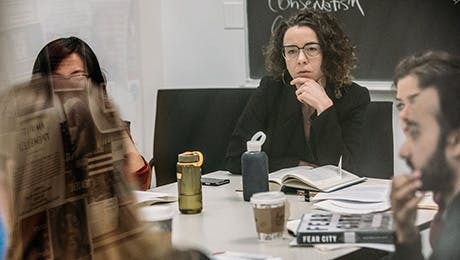 The PhD in Politics is designed for students who have completed the Politics MA at The New School for Social Research or a comparable master's degree from another university. The PhD provides maximum flexibility, enabling graduates to develop the highest level of competence in their chosen field of scholarly specialization. The PhD candidate must also pass written examinations in two of the four departmental fields (political theory, comparative politics, global politics, American politics). The candidate must finally pass an oral defense on a proposal for a PhD dissertation and write the dissertation. With limited course distribution requirements, faculty consultation is essential to prepare the for the PhD qualifying exams and dissertation writing. At the PhD level, all students are required to take a course in quantitative methods along with one other relevant methods course. This requirement can be met by courses in qualitative methods, advanced quantitative methods, historical methods, or fieldwork. Courses offered by other departments can be used to meet this requirement. Students in the PhD program must take two of four field seminars: Field Seminar in Political Theory, Field Seminar in Comparative Politics, Field Seminar in Global Politics, and Field Seminar in American Politics. These courses assess the most important research in these fields. One of their purposes is to prepare students for the field examinations (PhD Qualifying Examinations described below). (It must not be assumed, however, that the field seminars constitute sufficient preparation.) Students not in the PhD program may take a field seminar only with the instructor's permission. This course is designed to focus the work of PhD students, primarily research papers and dissertation proposals, in order to prepare them to write a dissertation. The specific direction of the course is always shaped by the work and interests of the students along with relevant work that the instructor introduces. Normally the PhD seminar is offered as a year-long course for three credits, meeting every other week. In addition to the PhD seminar, doctoral students are required to take at least one course directly connected to their PhD research. This course may be a preparation for the dissertation prospectus under a faculty member's supervision. Alternatively, a student may take one or two courses of directed dissertation research for credit under the supervision of the chair of the dissertation committee. Students must take written PhD qualifying examinations in their major field (political theory, comparative politics, global politics, or American politics) and one other minor field. An oral examination, consisting of an oral defense of the student's dissertation proposal, is also required. Complete information about PhD examinations is contained in the department handbook (see the link above). All PhD candidates must demonstrate reading knowledge in a foreign language appropriate to their dissertation topic by passing a language examination administered by the department. A full account of degree requirements and procedures is contained in the Politics departmental handbook.